For many decades of my life, I failed to understand religions. When I looked at people through lens of religions of the world, people looked different, separated and conflicted in quiet times. Every religion seemed to have a public relations person or persons, who methodically seemed to express exaggerated, aggressive and monolithic opinions at times to berate other religions. It seemed like a recruiting and retaining campaign to maintain a leading positions on world stage. Fear of disappearing from face of planet earth was the driving factor underneath claims of superiority and promise of salvation. It seemed everyone was paying attention to what was being said and yet the world seemed the same, people did not seem to change and history seemed to repeat itself. None of this made sense to me for a long time, due to my limited awareness of the world. My limited awareness was due to information coming from researchers, intellects, religious leaders, commentators and portrayal of historical artifacts. Due to lack of personal effort, I could not authenticate or negate this information. Thus, I maintained long distance relationship to all religions and religious scriptures. The reason for my long distance relationship was my lack of confidence in information received from religious platforms growing up in India surrounded by people of all religions. Today, I know I was not alone. At that time, I thought I was the only one perplexed looking to articulate my anxieties. I also noticed, in times of calamities and disasters, all religions ceased to exist as differences seemed non-existent when people were focused on putting an end to suffering and pain. It seemed people had one religion in moments of collective effort for a common cause. The common cause being end of human suffering and pain. It seemed for the collective cause all rivers of religions seemed to fall into ocean of humanity. The ocean of humanity did not differentiate between waters of rivers falling into it. It seemed humans in times of distress operate from highest level inside them. I also noticed, as soon as times of common grief was over, humans reverted back to their divisive nature under pretext of religion. My take away from my observations and experiences was that humanity is one religion above and beyond all other religions. I came to know humanity as my religion. Though I am born in Sikh family, I am Human first and then Sikh. I cannot be a Sikh, if I do not think, act and live as a human my day to day life. During my times of inner struggle, I was unable to articulate and express my thoughts as above. I did not have endorsement of Guru at that time. Until I did not find endorsement of my true, but weak thoughts, they remained buried inside me. At that time, I struggled in confusion to choose. For sake of convenience I selectively chose to identify with Sikhi. I selectively identified with certain aspects of Sikhi. In fear of loneliness of rising above thoughts of rejection by my small world, I spoke without conviction, afraid of what others will think about me and how they will perceive me. Instead, I remained a chameleon for long time. By grace of Guru, my life become more turbulent in terms of life events forcing me to rise above my confusion to avoid drowning. I had to choose between being a master chameleon or discover my true color. My questions grew sharper and focused, piercing me, without any answers in sight. At this point in time, I was put in touch with someone I have never met till today. I was told to read Japji Sahib on my own. I was startled to hear, as I did not ready Punjabi in school. By Guru's grace I was able to overcome my handicaps and excuses. At that point, Guru started my self-discovery. I came in direct contact with Guru through Bani . Guru guided me to unto himself peeling away layers of my confusion. I had no time for comparisons, no time for intellect or contemplation. When one is aware of their drowning, there is no time for conflict inside. Clarity was replaced with confusion by Guru. Weak thoughts of truth were strengthened. Confidence and conviction in words made my relationships harmonious and pleasant. It became clear to me, if I see other religions as inferior, limited, flawed or outdated, or I consider my religion to be supreme, I must have limited awareness. I must belong to one of the religions of the world, and not humanity. When I speak from comparative studies about religions of the world, I am limiting myself. A Sikh is not limited, a Sikh is Human first. When I as a Sikh, if I make commentaries on Gurus and Bhagats' Banis to publish comparative studies supported by information from other sources, historical perspective, I am selling divisiveness and conflict in name of religion. Humanity is not about competition and intellect. We need to catch our subtle short comings as Gurus Sikhs. We need to be careful in our thoughts, actions and self-admiring activities. A Sikh needs to be aware of sellers of self-admiration among us who blinded by their ignorance are shooting themselves in foot and also hurting others. Approach self-admiration with compassion, not with aggression. Imagine two scenarios on a busy street where there are lot of people passing by. First scenario: Two friends run into each other after a long time. They greet each other smiling, hugging and looking into each other eyes, brimming with joy. Will this scenario stop the traffic? Will this scenario make people stop and watch? Will this bring any press reporters on the scene? No, not at all. Do you wonder why when something so beautiful happens, it does not rivet our attentions and we stop all other activities? Second scenario: Two angry people are shouting at each other, arguing, and enter a fist fight on the same street. There is blood on their faces. Will this bring traffic to halt? Will this bring press reporters to scene? Will this grab everyone's attention? Will this become talking point for many days for many people? Do you wonder why conflict and aggression draws our attention quickly? When we participate in second scenario, we will make it to applauded gallery of scholars, intellects and commentators on religions of the world. The applauded gallery is like a city water tank, tall and high visible from distance for many miles. It will require effort (intellect) to raise the water above ground, and it will not be immune to its surroundings. Water in the high water tank will be cold in winter and hot in summer. The water tank will also remain limited, no matter how large it is. If our serving of Guru raises our Haume, reacting to our surroundings, we might have fallen off the path and taking many others down with us. Ask for guidance, stop such actions to be of service to Humanity. When we participate in first scenario, we are like water in ground well. We will not be visible from distance. We will not know our own depth and vastness. We will be immune to winters and summers on ground. We will have dug our own mind using methods provided by Gurus and Bhagats. We will not be commentators, intellects and religious scholars on their Banis. Our love of Bani will be in our thoughts manifesting as our Humanitarian religion and inward movement to find our true essence, the depth and vastness of which we shall never know. We will make effort to go inside ourselves and not into outside world to establish ourselves directly. Our Haume like the river of religion will dissolve into the ocean of Naam. Our life will be established because of Guru and not because of our outward intellectual efforts. 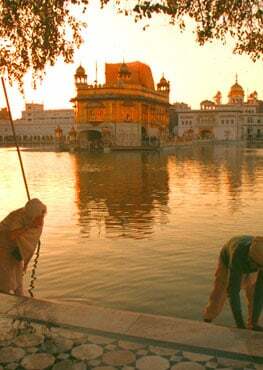 The water in high water tank is symbolic of Haume, the water in depth and vastness of well is symbolic of Naam. The Journey from the limited height to limitless depth is possible through Guru as Gyan or Shabad Guru. 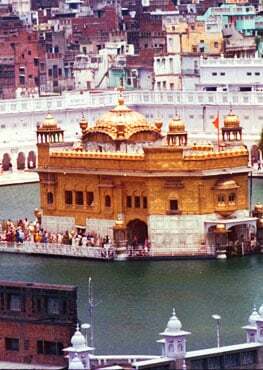 Guru does not let his Sikh rest in palace of illusion, on throne of ego, enchanted by dance of Maya, guided by greed and attachments as advisers, protect by soldiers of anger. Let Shabad Guru guide us to recognize the Sikh and Sikhi for us to see eye to eye with each other and rest of the world. Let Shabad Guru guide us to bring down all walls inside us to see all humans as one, from one creator, irrespective of perceived inequalities.